The thought of death may be scary for some, but the promise of life unending as we see past this life through eyes of faith makes perfect sense. The saying no one lives forever holds true to this life only, but as a Christian we know that we pass from this life to be with Christ who while we had our being kept us through many trials and he never forsook us. (2 Corinthians 5:6-9). Therefore we are always confident, knowing that, whilst we are at home in the body, we are absent from the Lord: (For we walk by faith, not by sight:) We are confident, I say, and willing rather to be absent from the body, and to be present with the Lord.Wherefore we labour, that, whether present or absent, we may be accepted of him. We are all born into the flesh body, but we do not have to continue living in the lusts of it or be carnally minded as our Lord has given us a way out by renewing our minds and and to set our mind on the life giving words of Christ. For the flesh brings death to ones soul and a carnal mind is an enemy against God. (Romans 8:5-10). For they that are after the flesh do mind the things of the flesh; but they that are after the Spirit the things of the Spirit.For to be carnally minded is death; but to be spiritually minded is life and peace. Because the carnal mind is enmity against God: for it is not subject to the law of God, neither indeed can be. So then they that are in the flesh cannot please God. But ye are not in the flesh, but in the Spirit, if so be that the Spirit of God dwell in you. Now if any man have not the Spirit of Christ, he is none of his.And if Christ be in you, the body is dead because of sin; but the Spirit is life because of righteousness. 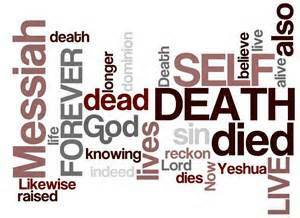 Jesus himself taught of the importance of dying to ones self as a way of being his servant, and this is an honor to God the Father for his sole purpose upon this earth was to serve his Father in heaven! (John 12:23-26). And Jesus answered them, saying, The hour is come, that the Son of man should be glorified. Verily, verily, I say unto you, Except a corn of wheat fall into the ground and die, it abideth alone: but if it die, it bringeth forth much fruit. He that loveth his life shall lose it; and he that hateth his life in this world shall keep it unto life eternal. If any man serve me, let him follow me; and where I am, there shall also my servant be: if any man serve me, him will my Father honour.